This holiday extended for 8 days, consisted of biking from England by ferry to Northern Spain, using a good quality hotel as a base, and biking around the surrounding country on a daily basis. The itinerary was straightforward, the time early July. Board a Brittany Ferries ship at Plymouth, Southern England and sail to Santander in Northern Spain. Bike approx. 15 miles to a 4* Hotel (Pillion passenger not interested in roughing it!! - neither was I, to be honest) and use hotel (5 nights stay) as a base to investigate the surrounding towns and countryside. Then return to Plymouth via Santander and the Ferry. Approx. 8 days in total. This being my first trip to Northern Spain, I needed information on roads and places to see in order to make best use of the limited time, so I sought out a travel guide. The excellent "Insight Guide - Northern Spain"(APA Publications) not only gives you the interesting history of the country, but a detailed insight into the culture, a run-down of all places worth seeing with detailed maps and quality photographs, the likely weather at different times of the year and, of equal interest, suggested routes for exploration broken down into excursions of different lengths. 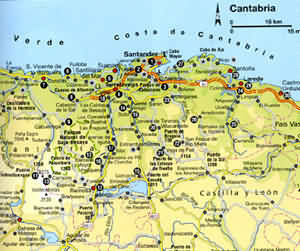 A typical map showing the area for about 50 miles around Santander is shown alongside - the numbers in the black circles identify sites of interest which are reviewed in the text of the guide. It is so well done, the book is well worth reading even if you aren't visiting the country! - but given the money invested in the holiday, it seems to me an essential purchase. I wouldn't be without one of these guides (or similar) when travelling to a new country. In trying to broadly plan out where we would go, it was easy to get carried away with an ever growing "must see" list, but, with a little realism creeping in, and an appreciation of the size of the country, the guide allowed us to home in on a number of "options" for trips out, of differing distance, which we could adopt or modify depending upon the weather, mood ....or any other number of variables. A large scale road map was also purchased to ensure that we didn't lose our way! Also, as this was a touring and site-seeing holiday, an intercom between rider and pillion seemed like a good idea. The one I purchased was a Nady PMC-2, battery powered (but could be wired to the bike's battery), providing simultaneous two way communication, with noise cancelling flexible boom microphones. The headsets fitted relatively easily into the helmets and once secured didn't get in the way and caused no inconvenience other than connecting and disconnecting from the control unit when removing and replacing helmets. Not having been on this type of holiday before, and not knowing the routine, we arrived early at Plymouth, and joined a growing assembly of bikers outside the main entrance gates, Weather was warm and sunny, and already the protective biking jacket, designed for England's cooler days, was beginning to get over-warm! Motorcycles, push-bikes, and hikers collected in an haphazard group towards the front of the queue, with cars stacking up behind in ordered serried ranks. Here the "camaraderie" began to make itself felt, an hour was spent in the warm sunshine making acquaintance with all manner of travellers, some pursuing daunting (to me) adventure plans, others lifelong dreams, and some just getting from a to b to see relatives or whatever. I wish I had taken more photographs! - see a few below.The Surrey Trike Club was there, off for a fortnight's holiday, and this rekindled a longstanding interest in owning a trike, the thoughts still lingering in the mind, like a virus, growing perceptibly with time! A gradual feeling of relaxation and excitement was building up - at long last - the road to freedom lay ahead! When boarding time came, the bikers and "odd-shapes" (as the the passport control had informed us we were) were herded into a small compound on one side while the cars and caravans loaded. Then, the motley collection was released and, following those who seemed to know what to do, we made our way up the ramp into the bowels of the ship. This ramp was a little bit scary first time, it appeared quite steep, and, with a heavily loaded bike the thought of having to stop and re-manoeuvre half way was worrying - but we waited for a clear run and went up successfully, parked up where directed and proceeded to follow everyone else in securing the bikes to the side rails and unloading the gear. Having been before in the Bay of Biscay (between Plymouth and Santander) in a storm - I made sure the bike was secure. Then up to find the cabin (I mentioned we weren't roughing it! - those not choosing to have a cabin can book a special reclining seat for a few hours shut-eye overnight), get off the by now hot gear, into shorts and T-shirt, and up on deck, ready for whatever the next 24hrs of crossing would bring. The crossing was relaxing; entertainment in the bar at night; cinema if needed; etc, - thoroughly enjoyable, and the weather flat calm - flat calm in the Bay of Biscay! - couldn't believe our luck - this was clearly a good omen for the week ahead! Arrival and disembarking was uneventful, although in finding the right way out of the busy city of Santander, on the right hand side of the road(! ), I was glad of the easy intercom communication with pillion - a very worthwhile investment. The small town we were heading for was "Isla", about 15 miles or so east of Santander, and the hotel - the Hotel Olimpo. Arrived, after having to ask for directions to the hotel in the main square of Isla, unloaded, secured the bike and booked in - met two other bikers with pillion riders arriving at the same time. The parking area was fine and a secure gated area at the back of the hotel could have been used - but this would have meant having difficult access to the bike when the gates were locked mid-evening. The only disappointing aspect was the position of our room - it faced north and as such didn't get any sun at all, and was above the delivery/kitchen area which was at times a bit noisy. However, as we wouldn't be spending much time in the room - it was adequate - the facilities in the room were very good, comfortable and clean. Also, it had one advantage in that we could see the bike and parking area, so would be more likely to hear the alarm should it go off. However, if you were to be spending time in and around the hotel, (remember, this is not always a hot place, particularly in the evenings) it would be essential to have a south facing room - many of these had large balconies which were bathed in sunshine all day long. On the whole the hotel was very good, the rooms were clean and well maintained, the breakfast facilities (self-service) and choice of food were excellent. The dinners were more formal in the dining room although the waiter service was not always as smooth as one would have liked, and some of the evening dinners were not really up to 4* standard. The hotel also lacked a comfortable lounge area with soft chairs for a late evening drink - there was a good coffee/lunch area (see photograph below) but although it was fine during the daytime, when the evenings cooled down, the hotel really needed something more comfortable. The pool was simple and adequate, but with a limited area for lounging around the pool. Nevertheless, when we returned from our daily biking excursion late afternoon, we invariably found room to lounge, sip long cool drinks and discuss the day's outing and the next day's plans. The hotel grounds dropped down directly onto the relatively uncrowded beach. Isla was a bustling little town, compact, clean, and with the usual trappings of a town beginning to embrace tourism. The aerial photograph shows its location well, although there has been some development since it was taken and much more is currently underway. Let's hope it isn't overdeveloped and so loses its local charm and character. The beaches, because of the tides, are more like those in England than those on the southern side of Spain (Mediterranean), having a gently sloping expanse of hard wet sand frequently washed by the sea. The sea, being the Atlantic, is cold, and if you can stand it, invigorating! - however, you've always got the Hotel pool to slip into. The countryside scenery was beautiful, and the main roads excellent and, outside the main conurbations, uncrowded. Petrol stations were readily available on the main roads, but few and far between once off these. The towns along the main roads south heading over the mountains had modern facilities incorporated within their historic charm and were generally well-tended - there seems to be an enormous amount of civic pride here. Ramales de la Victoria was particularly fine - a regular stop for coffee or a snack. Even in July, the countryside was mainly lush and green - this is why it is known as "Green Spain". The Insight Guide states that Northern Spain receives as much rain as Wales (! ), due to the mountains which rise up southwards from the coast. Some photographs taken during our daily excursions are shown below. Medium sized roads were also good and presented no problem, whereas the minor mountain roads, zig-zagging up and down the mountains, had a mostly rough surface and required some concentration, particularly on gravelly hairpins! However, once negotiated, the scenery at elevation was a delight, the peacefulness, clean air and wildlife creating a beautiful and interesting environment. We stopped regularly to sample this "Elysian quiet" and "silent Nature's breathing life". The only regret was that we had such limited time; there were so many beautiful places to see - and the scale of the country is so large - 5 weeks would have been preferable to the five days we had! All good things come to an end - finally the day for departure arrived and back to Santander we biked - the sky, reflecting our heavy hearts, was overcast, and intemittent drizzle/rain fell. The boarding, now knowing the ropes, was easier second time around and the trip home was very pleasant - Bay of Biscay flat calm again(!). We will be back as soon as circumstances allow. the simple NADY intercom was a really good investment (~ �60-70) -It really enhanced the enjoyment of the biking - being able to readily discuss the sites and scenery, when to stop for drinks or lunch, and what direction to take(!) was a major benefit. The batteries lasted the full holiday and the small control unit easily fitted into a top pocket with the volume control capable of being operated through the jacket - although once set at a comfortable level, there was never any real need to change it. The only problem was remembering to disconnect the pillion from the control unit before she jumped off! Also, even though I used an open face helmet, there was never a problem with wind noise (although it must be remembered that this was a cruising/touring holiday - not a TT race! )- in fact the quality of communication was far better than I had expected. The intercom is now a permanent feature on any outing.